It’s Almost Here! was posted on May 21st, 2015 and is filed under Healthy Living. This entry has 3 comments. You can follow any responses through the RSS 2.0 Comment Feed. I am so excited! I have been prepping for this year’s Colourful Smoothie Challenge for a couple months now…and it’s almost here! I’ve had people wondering if I was doing it this year…and this answer is a resounding YES! In case you didn’t remember from last year, or you’re a new reader, here’s what’s happening! For the whole month of June we’re challenging ourselves to one smoothie a day – and I’m inviting you to join in with me! All you have to do is tweet or instagram me pictures of your smoothies! Ya’ll know I LOVE my smoothies (my instagram is littered with smoothie pics). Last year I think we had about 75 people sign up for the challenge! The sponsors for this year’s challenge have gone crazy and been super generous…and I can’t wait to reveal all of the details and the prizes NEXT MONDAY (so don’t forget to drop by)! It just gets better every year! They say it only takes 21 days to form a habit, well…this challenge is going to make us commit to learning a healthy habit for 30! If you’re curious, here’s a look at last year’s challenge (and some of the amazing prizes and this year is BETTER!)! 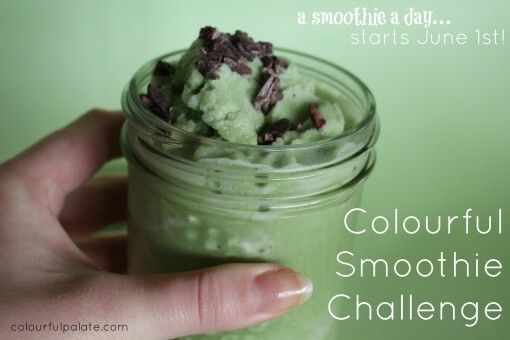 a colorful smoothie challenge sounds like one I’d be up for! Oh…. what a fun one!